"My legacy. My life. My band. 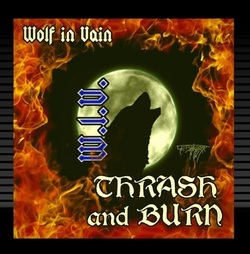 Wolf In Vain is the result of my desire to not just play, but be thrash metal. The band made it's debut in 2013 with the EP, "Thrash and Burn". While I was the only band member at the time, I pushed on to make sure the EP would be what I envisioned while in my last band." "I had been in a band from 2010 to 2013. We never made it anywhere, though, due to a lack or drive to make music from anyone but myself. I wasn't in this for money or fame. I wanted to rock, that was all. Toward our final days, we began receiving bad rep through the actions of one such member. I had to make the decision. "Sure, the guy was my best friend since middle school, but that couldn't hold me back. So, I ended the band. I started fresh. Being the lone wolf, I set out to make a new name for myself in the world of thrash metal. I was the lone wolf. I did everything in the last band...in vain. Put two and two together, and what do you get?" "This was the first original piece to be released from Wolf In Vain. And what a release it was! This EP was power-packed with super fast riffs and intense lyrics. I never thought this would be my first thrash metal release, but here it was! "The EP was actually started a month after the disbandment of W.O.L.F. and was started as a vent of anger, after a member had betrayed me and everything I lived for. Years of my life stolen away in less than a few months? Yeah, I needed to write, and I did! Recording was very short, only lasting a month and a half. Then again, it was an EP. No reason to take too long. "With lyrics discussing schizophrenia, war, murder, and, course, thrash metal, itself, I felt that Wolf In Vain was off to a fantastic start. Now all I needed was some official members." "It took a year before we hit the stage. There were numerous shows beforehand, but they were simply Tab Deum with a mic, backed by music tracks. I didn't feel like I was Wolf In Vain. I felt like I was doing karaoke. Todd Conrad joined, however, during the end of 2013. Our on;ly problem had been finding a practice pad. Eventually we began practicing in his apartment. August 3024 came about and we began gigging, as a two-piece, with good receptions with the audiences. Wolf In Vain played one final show in December of the same year, with yours truly announcing a live show hiatus due to the writing of the album.